The concept was coined by Silicon Valley entrepreneur Sean Ellis in 2010. Initially popular among fast-growing startups, the principles of growth hacking have since spread to the wider business world. The concept of growth hacking has often been misunderstood. To the uninitiated, it can conjure images of manipulation, control, or even gaming the system. But growth hacking isn’t something evil. It’s simply looking at your product or service across several channels to identify effective and efficient methods to grow and extend your business. As a small business with very limited resources, you have to use unconventional methods to grow your business. Growth hacking is the combination of product design, marketing, and data with the overall goal of driving customer growth. Hotjar is a powerful growth hacking tool to reveal true website user behavior and experiences. The platform gives you great insights and the big picture of how you can improve your site’s user experiences (UX) and conversion rates. It’s not easy finding a free analytics tool which captures ‘who’ and ‘what’ your visitors are doing on your website. The tool allows you to record real-time user activities (video), collect click events inform of heatmaps, carry out surveys and collect feedback on specific pages of your site. SumoMe is a powerful growth hacking tool that offers you a collection of apps and tools to help you grow your email list. The tool allows you to ask your website visitors for their email address without hurting their feelings or disrupting their activities on the site. SumoMe is compatible with a range of website-building tools, including WordPress, Shopify, Tumblr, Weebly, Squarespace, and Blogspot. It also allows you to easily integrate with popular email marketing tools including MailChimp. Buffer is a very cool app that helps brands effectively manage and automate their social media contents. Rather than having to log into all of your accounts separately (e.g. Facebook, LinkedIn, Twitter, Instagram, Google+), Buffer lets you create posts that are sent directly to these accounts or scheduled for a particular time and day. With the Buffer free account, you can schedule up to 10 posts at a time across all your social media pages. Buffer also offers a browser extension for Firefox, Chrome, and Safari that lets you share content from any Web page. SEMrush is a complete SEO tool which lets you do keyword research, track keyword ranking, check backlinks, check competitor ranks, and most importantly, do a complete SEO audit of your website or blog. SEMrush allows you to get a behind-the-scenes look at your top performing competitors and use the insights to build profitable keyword strategies and campaigns around your website. Find profitable keyword opportunities, pinpoint high-converting ad and landing page copy, dissect competitor content strategies, audit backlink profiles and more. Email Marketing is one of the cheapest forms of marketing for small businesses. And a crucial part of making this happen is to invest in a great email service provider. That is why many businesses have adopted Mailchimp for this purpose. Mailchimp offers excellent features and an easy-to-use interface that make it a top choice whether you are sending out a family newsletter to 20 people or a professional marketing campaign to 20,000. Also Read: 7 Essential Digital Marketing Strategies For Small Business Owners. Your best customers might be visiting your site right now, looking for support documentation to solve their issue. If you don’t solve their problem now, they’ll quit using your product. Drift is a messaging app that makes it easy for businesses to talk to their website visitors and customers in real-time, from anywhere. With Drift on your website, any conversation can be a conversion. Instead of traditional marketing and sales platforms that rely on forms and follow-ups, Drift connects your business with the best leads in real-time. Drift lets you answer all of those people’s questions, right from your website or app. With a tiny popover, customers can start a live chat conversation with your team about their issues or you can get in touch proactively with info targeted to their needs. An SEO audit is a detailed analysis of your website on how it is read by search engines in terms of titles, meta descriptions, keyword density, the uniqueness of content, backlinks, page speed etc. SEOptimer is a free SEO audit tool that investigates a given URL’s on-page SEO ranking factors. After you analyze a URL, the tool presents a summary of the most important action items to be taken to improve the SEO of such website. Also Read: Email Marketing for Small Businesses – 7 Best Practices & Tips. Google Analytics is an advanced web analytics tool which can help you measure how your business online presence and marketing is doing. It gathers vast amounts of data about user actions on your website. You can use Google Analytics to investigate basic analytics questions such as how many visitors your site had over a period of time, how often repeat visitors come back to your site, how visitors get to your site (e.g. referral, ads, direct, links or email), which countries are your visitors coming from, which pages on your site have been visited the most, the average time spent viewing your site and many more. Inbound is a community-based news platform that offers a variety of marketing-related articles and industry news. With this growth hacking tool, the user can create their own feed of discussions, expert blogs, and other marketing content. Users can also participate in discussions within the community. Popular topics include Strategy, Content, SEO, Branding, Social Analytics, Blogging, Mobile and much more. Another alternative to Inbound is GrowthHackers.com founded by Sean Ellis. Want to learn more about growth hacking? 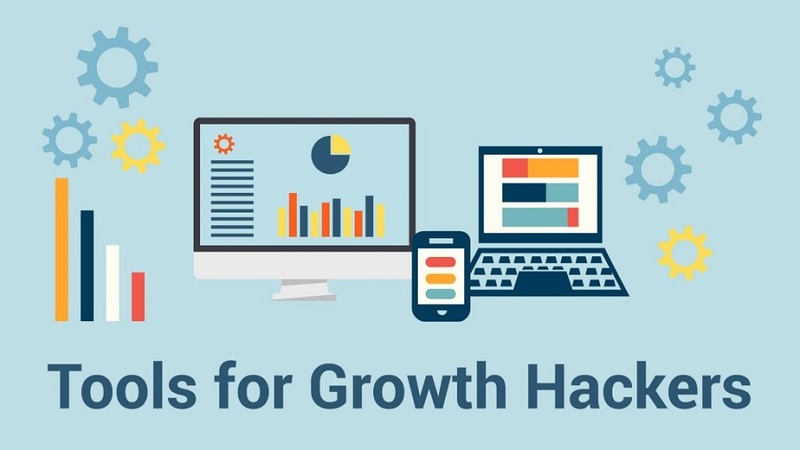 I recommend taking this free Udemy course on growth hacking for small businesses. The course will open you up to the practicality of using some of the tools mentioned in this post to grow your business.